"Ain't always what it seems..."
Living in a big city means that you will generally run into people that aren't like you if you also happen to work outside of your neighborhood. Conversely, living in a big city but working in a particular field or living a life of atypical production can mean you running into the same kinds of individuals over and over again, usually folks who are very much like you. 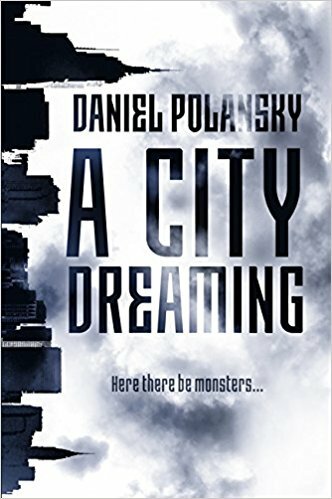 Such is the case of living in New York City and it is definitely the case of living in the fictional NYC of Daniel Polansky's A City Dreaming. The book follow the character of M, a magic user who has returned to New York after five years traveling. He is a drinker that wants nothing more than to enjoy life and be left to his own devices. Unfortunately M is also in a weird alliances with power brokers in the magic world and has lived for a very, VERY long time in which he has gained enemies, friends and a reputation. The world of magic in A City Dreaming is a community ranging from low level people with limited magical ability to two "Queens" who control Brooklyn and Manhattan. There are also magical creatures, other dimensions accessible by subways that appear where only certain people know where to look and The Management which seems to control how much magic and good will a magician can tap into. To be honest, I'm not a huge fantasy fan. I used to like the Xanth books when I was a teen and I read Lord of the Rings because but I've never been a big fantasy person. Urban fantasy is probably the only fantasy that I can really deal with currently, such as the works of Daniel J. Older and Victor Lavalle. This is why I gave Polansky a chance. This book is divided into chapters focus on a single incident or mission that M must complete. It is funny and familiar territory. The added bonus of it being set in the city that I was born and raised in gives another level of enjoyment. It's always a plus when you can get a full image of a location in your head and, even if you aren't familiar with NYC, Polansky provides excellent descriptive language so that you can get the vibe of the bars, parks and streets in his book. As I said in my first paragraph, a big city can provide you an introduction to other different people but it can also create insular communities where you see the same type of people. The characters in this book are different but they all seem possessed of a bit of a "holier than thou" aura by virtue of them being magicians at times. On top of that, NYC is a melting pot but there are also spaces where different people do not often meet. M goes to a lot of these venues. It is all of this that gives the reality to this version of NYC. Good or bad it it accurate. New Yorkers love their city but can also be proud to be in their own tribe and look down our noses a bit at other groups. But, we can also unite in times of crisis. New Yorkers will step up and take up arms to defend their city, either the city as a whole or our interpretation of how NYC should be. Polansky captures this well in his description of M and his associates, particularly towards the end of the book. A City Dreaming is a series of stories about a guy living his life in the city that never sleeps. There is magic in the tales and drinking and carousing with friends and train rides and exploring the hidden heart of the five boroughs that make up the Big Apple. So, basically, it's a very New York tale. Read it.